Weather watchers measure the precipitation at 09.00 local time at the same time as they do the other weather readings. There are many different types of rain gauge. A couple more examples are shown here. Remember that it is important to put your gauge away from anything which might stop the rain getting into the gauge. You do not want a tree or a wall acting like an umbrella. When you have finished reading about this you may want to return to Precipitation or the Collecting Data page. You may also like to have a go at the Rain Gauge Quiz. 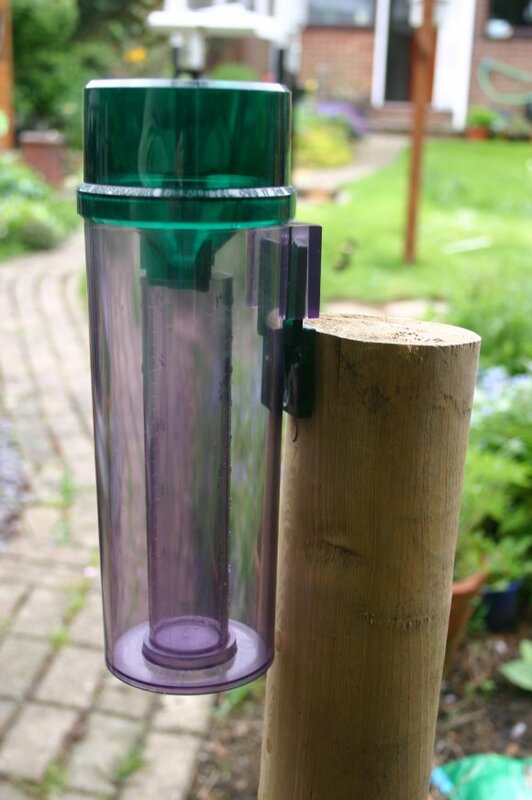 See More About Setting Up for details of where to place your rain gauge. It would be very bad if the rain in your gauge evaporated before you took your readings. Some gauges have an outer container with a funnel which channels the rain into an inner measuring container. 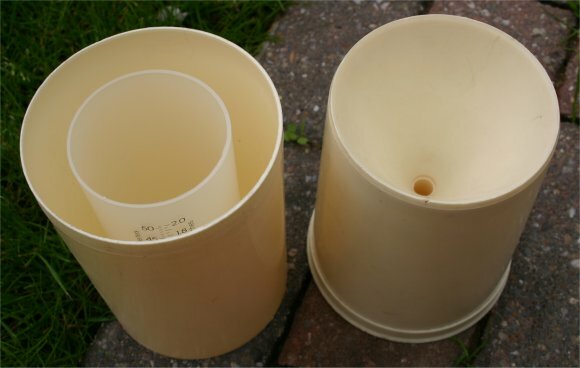 The example on the right has had its lid removed to show the inner container. 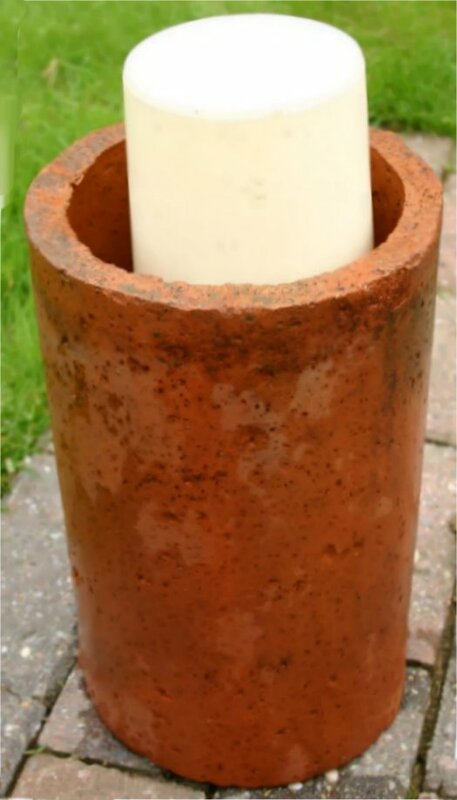 Here is a rain gauge placed into a earthenware tube. This stops it from being blown over by the wind or accidentally being kicked over. This type of gauge can be mounted on a post or fence. Here it is shown slotted into its mount. Note how the gauge has been placed so that its funnel is above the post. If it were not placed like this the post would shield the gauge from the rain and the readings would not be accurate. Rain gauges are made with the funnel the correct size to produce appropriate readings. If you use a specially manufactured gauge you will be able to compare your readings with others. 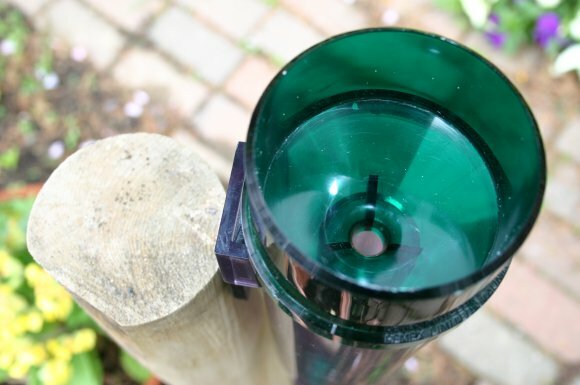 Although it is fun to make your own rain gauge, it is hard to make one as accurate as the bought ones. When you are away you could leave an automatic rain gauge taking readings for you. These should be placed just as carefully as ordinary ones, well clear of anything that would stop the rain from reaching the funnel. See more about these types of devices on the ICT and the Weather and More about ICT and the Weather pages. Some are stand-alone devices and some are built into weather stations. 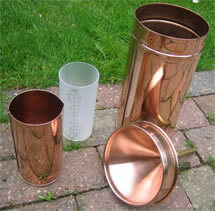 This copper rain gauge is made up of several parts. Copper has been used because it will not go rusty. It is also good at preventing mould growing in the damp conditions. This type of rain gauge is quite expensive. 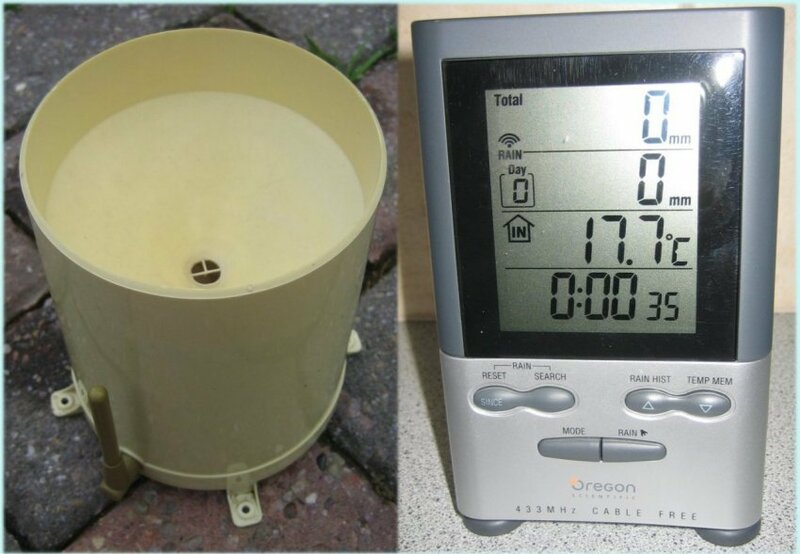 Some automatic rain gauges use a tipping bucket mechanism to measure the rain. When one side of the see-saw buckets fills it becomes too heavy, tips and is counted. The other side then starts to be filled. This type of rain gauge may not be quite as accurate, as it may not rain enough to tip the bucket, so that bit of rain does not get counted. The video shows what is inside the funnel, and demonstrates the tipping. You can also see the aerial which sends the data to the receiving station. If you want to find out if the location of a rain gauge does affect the amount of rain collected you could try the Where is the wettest part of the playground? activity on the Teacher Resource Exchange. Precipitation webquest - Use the Precipitation page, this More About Precipitation page and other Weather for Schools pages to answer some precipitation questions. Type your answers into the MS Word document containing the questions.